Dodge changes up the midsize sedan Avenger for 2011 with updated and improved fuel-efficient engines, an all-new interior and an all-new chassis. The four-trim lineup is well defined, giving buyers clear value-based choices in the Avenger line. The Avenger’s four-trim designation has “lifestyle” names, which as you can imagine are designed to conjure up visions of how you can see yourself being transported in a Dodge. Starting at $19,245 with the four-cylinder engine mated to a four-speed automatic transmission is the keep-it-simple economic, entry model — the Express. The 2011 Dodge Avenger Express is value-oriented at under $20,000, yet offers the finer amenities most drivers want, such as Sirius satellite radio, remote keyless entry, air conditioning, side-impact airbags, tilt/telescoping steering wheel and 17-inch Michelin tires. The Avenger Mainstreet also is equipped with the four-cylinder, but this upgraded level gets a six-speed automatic transmission hooked to the engine. Priced at $21,340, the value-for-the-money Mainstreet adds an eight-way power driver’s seat and automatic climate control to the equipment sheet, as well as premium high-efficiency tires and power heated/folding sideview mirrors. As the name suggests, Heat is the Avenger model designed to offer spirited driving with it 3.6-liter V-6 engine coupled to a six-speed automatic transmission with AutoStick. The sporty-styled Avenger Heat — featuring chrome-tip dual exhausts, rear spoiler and foglamps — rolls on 18-inch all-season tires and has its own class of premium cloth seats accented with red stitching. The Avenger Heat starts at $23,745. Also starting at $23,745 is the Avenger Lux. This model swaps out the V-6 engine with the four-cylinder in exchange for more interior luxury features, such as heated leather seats, Uconnect hands-free phone, a media center, express up/down automatic windows, among other features, too. 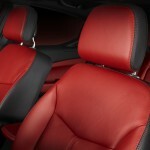 The Avenger R/T is all-new for 2012 model year and is not offered in the 2011 lineup. Dodge engineers retuned and redesigned the nearly the entire suspension system for confident, more spirited driving. The 2011 Avenger body is lowered and the track width is widened for an aggressive appearance. The result of this retuning is better steering, less body roll, and improved isolation for less body motion. A quieter cabin results from 45 new sound-deadening treatments. On the inside is an all-new instrument panel, upgraded seats with more supportive cushion material, new climate control outlets that better direct airflow, and soft materials devoid of the cheap plastic feel around key touch zones, such as the armrests and console area. Exterior styling enhancements show a more sculpted front lower fascia with a honeycomb texture grille with new projector beam foglamps. 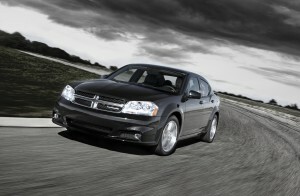 Dodge recalibrated its 2.4-liter four-cylinder World Gas Engine to deliver 173 horsepower and 166 lb.-ft. of torque. 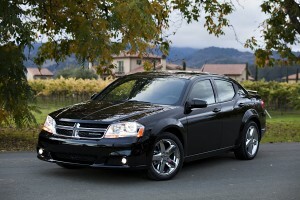 Coupled to the four-speed automatic transmission, the Avenger is EPA rated at 21 miles per gallon city, 30 mpg highway. The six-speed automatic rates at 20/31 mpg.